Print, uncoloured lithograph, The School House, Hawkshead, Lancashire, by Joseph Pennell, published by Macmillan and Co, London, 1901. On page 201 of Highways and Byways in the Lake District, by A G Bradley. Photograph, black and white, Hawkshead Grammar School, Hawkshead, Lancashire, by Herbert Bell, photographer, Ambleside, Westmorland, 1890s. Photograph, black and white, Hawkshead Grammar School, schoolroom, Hawkshead, Lancashire, by Herbert Bell, photographer, Ambleside, Westmorland, 1890s. Photograph, black and white, Hawkshead Grammar School, before alterations, Hawkshead, Lancashire, by Herbert Bell, photographer, Ambleside, Westmorland, 1890s. Guide book, A Complete Guide to the English Lakes, by Harriet Martineau, published by John Garnett, Windermere, Westmorland, and by Whittaker and Co, London, 1855; published 1855-71. 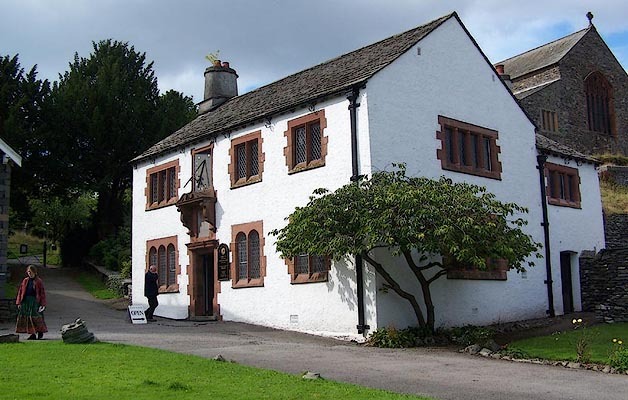 ... At the ancient Grammar School of Hawkshead, Wordsworth and his brother were educated. [Hawkshead] ... The Grammar-school, founded by Archbishop Sandys, has produced many eminent scholars. Mr. Rawlinson was a considerable benefactor. School, now museum. 1675, entrance rebuilt 1888, windows 1891. Roughcast stone with ashlar dressings, slate roof. 2 storeys, 3 bays. 3:2:2-light ovolo-mullioned windows, those to ground floor with 3-centred heads to lights, and label moulds to 1st floor windows; leaded glazing. Entrance between 1st and 2nd bays has architrave, pulvinated frieze with panel dated 1585; above, a plaque with armorial bearing and memorial inscription to the founder, and date 1675 (placed there by the builder) under consoled cornice, the brackets with incised decoration, with scrolly pediment and crest; above, an obliquely set sundial in eared and shouldered architrave. Rainwater head dated 1891. Left return has projecting gable-end stack with round shaft on square base. Right return has 4-light windows, with 3-light window to rear wing, which has gable-end and cross-axial stacks with round shafts. Interior has chamfered beams; elliptical-headed fireplace. Fixed benches and desks covered with the carved names of pupils. Panelled door with strap hinges leads to stone dog-leg stair. The school was founded by Edwin Sandys, Archbishop of York, in 1585, and built by Daniel Rawlinson. in 1675. 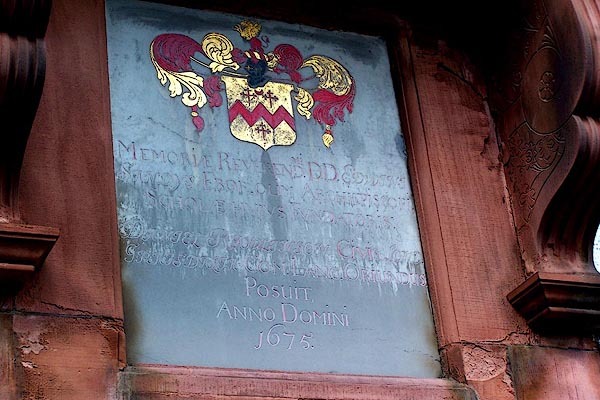 Its most famous pupil was William Wordsworth, who attended 1778-1787, and whose name is carved on a desk. Wordsworthshire, by Eric Robertson, Windermere, Westmorland, illustrated by Arthur Tucker, published by Chatto and Windus, London, 1911. Print, lithograph? Schoolroom, Hawkshead, from a watercolour by Arthur Tucker, published by Chatto and Windus, London, 1911. Tipped in opposite p.68 of Wordsworthshire by Eric Robertson. Set of prints, etchings? 56 views in Westmorland, Cumberland, etc, by Harry Goodwin, published by Swan Sonnenschein and Co, Paternoster Square, London, 1890. Print, etching? Hawkshead Grammar School, Hawkshead, Lancashire, by Harry Goodwin, published by Swan Sonnenschein and Co, Paternoster Square, London, 1890. Tipped in opposite p.18 of Through the Wordsworth Country, by William Knight. Print, uncoloured engraving, The Free Grammar School, Hawkshead, Lancashire, engraved by C and A Young, Edinburgh, published 1870. On p.91 of Furness, Past and Present. THE FREE GRAMMAR SCHOOL, HAWKSHEAD. hearsay Founded by Archbishop Sandys, 1585; closed 1909. William Wordsworth went to school here. Another pupil was the astronomer William Pearson, 18th century.